Today we released – BuddyPress Profile Integration Add-on & Paid Memberships Pro Add-on. Please go through their dedicated pages to know details about these add-ons. Our Documentation and videos will cover all you need. Still if you require help please post topic on our Support Forum. About 12 hours ago I ordered the Paid Memberships Pro but it is still not available in my “My Account” area's “Available Downloads” section. Is there another way to retrieve and download that? I have a development license for WPUF Pro. It is available for Download under your account from Dashboard. That is a bullet list of the same named file…. Ah, fixed 🙂 Thanks Tareq! 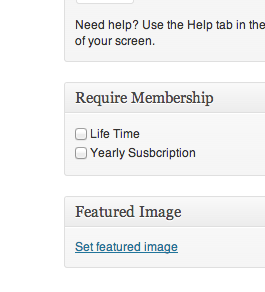 is the “Paid Memberships Pro” required? Paid Memberships Pro is required. It is 100% free plugin, but you can pay for service, advice, and access to their forums. I downloaded Paid Memberships Pro for the first time a few days ago and I plan to buy the developer service from them in a few weeks after I advance in our current project. So far (cross my fingers!!) it seems to work well with WPUF Pro! As per your advice I have purchased Paid Memberships Pro for recurring Paypal transactions… I have installed the plugin on top of the Frontend User Pro Plugin and I have activated charge for posting and force pack option… I do not see any Membership area… within the plugin area… either please add another step in the documentation or please help me to resolve this issue… Where and when will the membership area option appear? Did you install Paid Memberships Pro plugin? Hey guys. I have now installed the membership plugin and your add-on to integrate with WPUF. It seems to work however I m still setting up the SSL certificates now. The problem that I now see is that the Paid Memberships Pro also restricts readers from reading the posts without a membership. The point of me using the WPUF is to charge for posting not to restrict access to readers too… I do not think that I have missed an option to allow content consumption without membership. Any ideas? something you are doing is not right then. Make sure you are didn't select or restrict any blog/post page from admin area. If still having issue reply with admin details privately, so i can check this out. Yes, your screenshot helped. I had ticked the categories from within the membership pro plugin under the section *content settings* and the plugin started to protect the content on all post in those categories. Unticking all of the categories helped. Thanks. I can move to the next step now. Hi, I've purchased the WPUF and Paid Membership pro addon and works fine. But there is still a small problem there. When a user buy a free package with 0 euro for 90 days for example, then he can do renew the package and get more 90 days. I have to deactivate the renew button for the free package so users buy it once! In WPUF when you create a package with 0 price doesn't allows you to buy it again. This is the right way! Also I love the gateway payment of WPUF paypal or bank selection, but paid memberships pro doesn't have a choice for that. It is possible to add to paid memberships some features of WPUF?